d) I will give my Kindness Day presents to some nice people. The first time I made heart gifts was in 2013, but I used other designers’ patterns then. This year brings brand new version of my very own pattern for the Hand Full of Love- three Kindness Hearts. There is a Little Love Heart in wine red perfect for a key chain, a Smile-Bringing Heart in candle yellow that would make a beautiful Christmas-tree decoration and a Welcome Heart in deep blue- a great choice to decorate your entrance door. Such a cute gift is a great way to share some good energy with people around you, so why not to make somebody’s day with a present that requires only one or two hours of knitting? 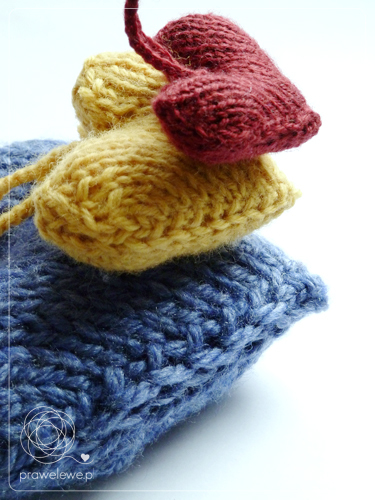 The samples for this pattern are made of wool but you are free to use any type of fibre you wish. I specified the weights of yarn by wpi in the instructions but in fact you can use anything you have on hand- the important thing is to work with proper size needles to create stitches tight enough so the filling does not show through. As for the stuffing, you may use toy filling or scraps of yarn or even use an old pillow’s filling. If you want the smallest heart to work as a key-chain, you will need a key ring, too. So would you like to try? It is a very easy project and I am sure you will come up with numerous ideas for using those cute hearts to bring smile to somebody’s face. The pattern is available in the patterns section → Kindness Heart. Have fun making these cuties and sharing the joy with others. Welcome to join my prawelewe group to share photos of your finished hearts.